You’ve heard it before right here, unless you’re taking a shower or getting a drink of water you don’t need any extra moisture around the house. Its spring and we venture out doors now to enjoy our yards and gardens and whatever else you like. First thing is be careful… well first thing is to dig through the shed and find the ladder. If you liked ladders it would have been done already, so don’t get sidetracked yet, the mower can wait. Whatever type of ladder you use, an extension, “A” frame or if the gutters are low enough maybe a pair of saw horses and a plank just be careful. Figure on needing a few heavy contractor bags for the debris depending on what’s growing around the house. Don’t figure because you don’t have trees that there is no junk in the gutters. Granules from the shingles accumulate and birds, squirrels and even that kid down the street that lost his tennis ball can affect your special place. Scoop out what you can before you hose them out. If you system empties into an underground system you have more work to do. Disconnect the downspout and clean them, THEN make sure the underground system is clean. Run a hose through it and check the discharge point. Actual photo – not a dramatization! Usually you can lean the ladder against the gutters themselves but use caution. I know… I’m starting to sound like you mom… sorry. 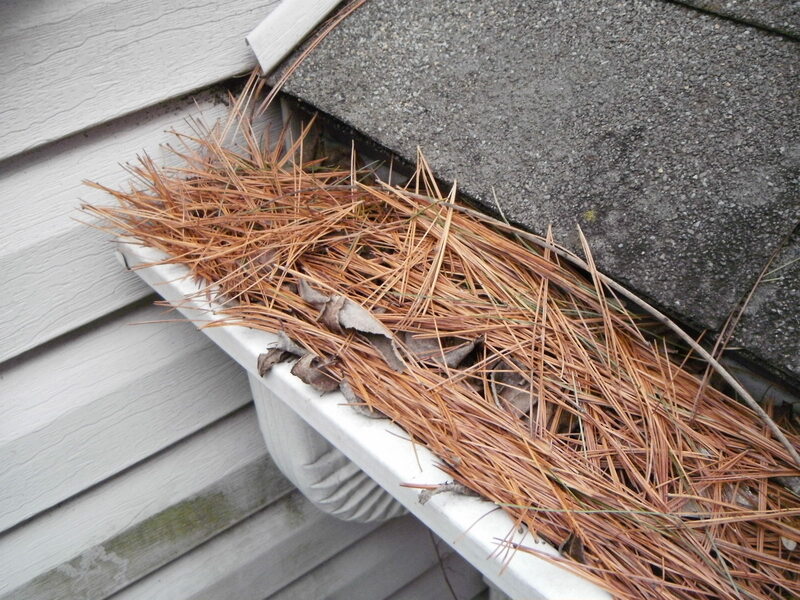 The point is that gutters should be cleaned twice a year or more depending on your particular layout. Neglecting this WILL mean that moisture will end up too close to the building and bigger issues will develop. Get it done now before baseball get rolling. I’ll remind you again in the fall. This entry was posted on April 3, 2012, 9:14 am and is filed under General Information. You can follow any responses to this entry through RSS 2.0. You can leave a response, or trackback from your own site.